The postcard above shows the London Road looking east from the centre of the main crossroads (High Bush Cross, or the Headington Carfax) in about 1905. 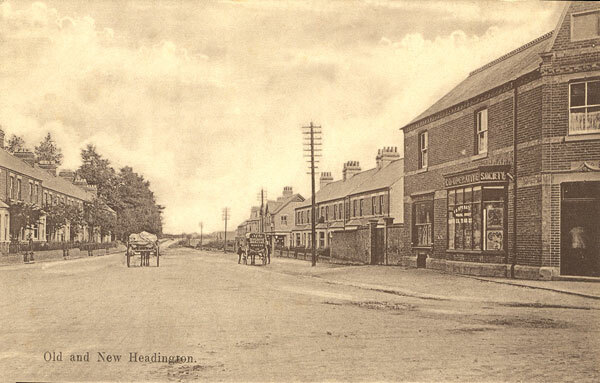 There were only two shops on this section of the London Road at this time, because each of the three Headington villages (Old Headington, New Headington, and Quarry) still had its own high street and shops. The sign on the delivery cart on the right of the old postcard reads: “Co-operative Society Ltd Bakers”, and the Co-op itself can be seen at the junction with Windmill Road. It was built in 1892 on the site of the former toll-house, and it was at this exact spot that the toll-gate used to bar the London Road until about 1880. The terrace of houses just beyond the Co-op were demolished to make way for Holyoake Dance Hall in 1938, but further on again the shop on the corner of Holyoake Road looks much as it does today. At the time of this photograph it belonged to H. S. Prior & Son (cycle engineers), who made the Highfield Cycle. The twin gables of St Andrew’s School are visible behind the fourth telegraph pole on the right, and on the horizon is the Headington Union Workhouse. On the left of the London Road is Westbourne Terrace, a row of houses now turned into shops: their front gardens were sacrificed to form the pavement here.